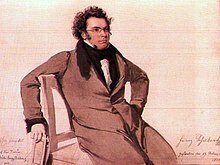 In 1897, the 100th anniversary of Schubert's birth was marked in the musical world by festivals and performances dedicated to his music. In Vienna, there were ten days of concerts, and the Emperor Franz Joseph gave a speech recognising Schubert as the creator of the art song, and one of Austria's favourite sons.Karlsruhe saw the first production of his opera Fierrabras. ^ Montparker, Carol (May – June 1981). "Radu Lupu: Acclaim in Spite of Himself". Clavier. p. 13. Botstein, Leon (1997). "Contexts: musical, political, and cultural". In Gibbs, Christopher H. (ed.). The Cambridge Companion to Schubert. Cambridge Companions to Music. Cambridge University Press. ISBN 978-0-521-48424-4. Denny, Thomas A. (1997). "Schubert's operas". In Gibbs, Christopher H. (ed.). The Cambridge Companion to Schubert. Cambridge Companions to Music. Cambridge University Press. ISBN 978-0-521-48424-4. Gibbs, Christopher H. (1997). "Introduction: the elusive Schubert". In Gibbs, Christopher H. (ed.). The Cambridge Companion to Schubert. Cambridge Companions to Music. Cambridge University Press. ISBN 978-0-521-48424-4. Gramit, David (1997). 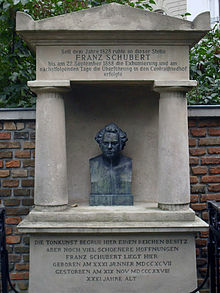 "Music, cultivation, and identity in Schubert's circle". In Gibbs, Christopher H. (ed.). The Cambridge Companion to Schubert. Cambridge Companions to Music. Cambridge University Press. ISBN 978-0-521-48424-4. Griffel, L. Michael (1997). "Schubert's orchestral music". In Gibbs, Christopher H. (ed.). The Cambridge Companion to Schubert. Cambridge Companions to Music. Cambridge University Press. ISBN 978-0-521-48424-4. Steblin, Rita (1998). 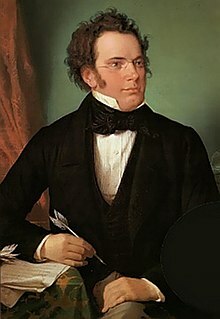 "Schubert's Relationship with Women: An Historical Account". In Newbould, Brian (ed.). Schubert Studies. Ashgate. pp. 159–182. ISBN 978-1-85928-253-3.